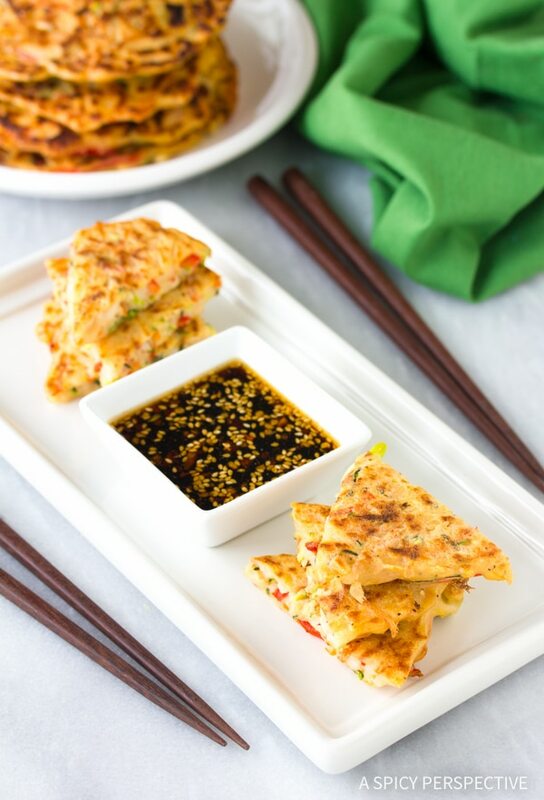 Korean Pancakes: Pajun (Pajeon) – This easy Korean pancake recipe, called Pajun is loaded with vegetables, and served with a spicy soy dipping sauce. If you’ve hung around A Spicy Perspective for more than a few weeks, you probably know I am crazy about global cuisine. I love experimenting with unique flavor combinations, exotic spices, and classic dishes from places we’ve traveled. 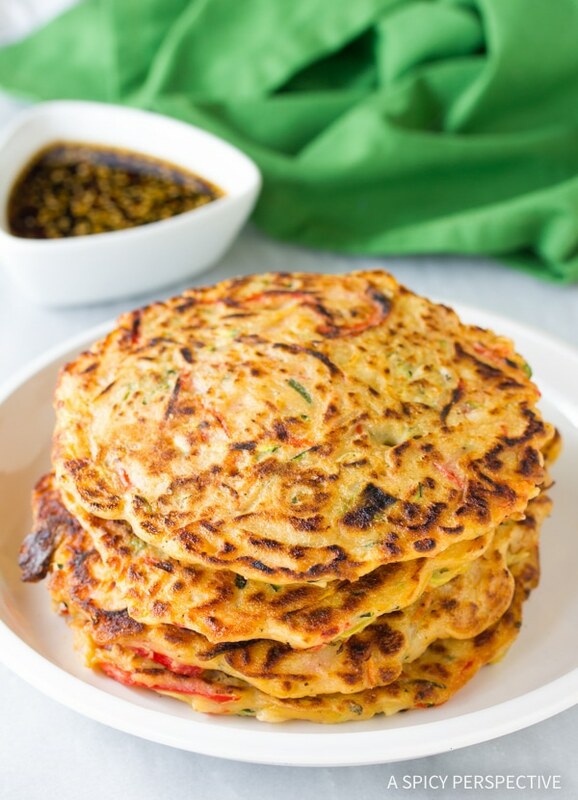 Korean Pancakes: Pajun (Pajeon) are made from a standard savory pancake batter mixed with shredded potoatoes and various fresh vegetables, then are pan-fried to perfection. There are no “unique” or “exotic” combinations here, unless you find the soy and sesame seeds in the dipping sauce exotic. And I’ve never explored Korea. I’ve only passed through the Seoul Airport heading to other locations. Nevertheless, my family has a favorite Korean restaurant here in Asheville, and we absolutely cannot visit without ordering the Pajun Korean Pancakes. They might be the best things on the menu. 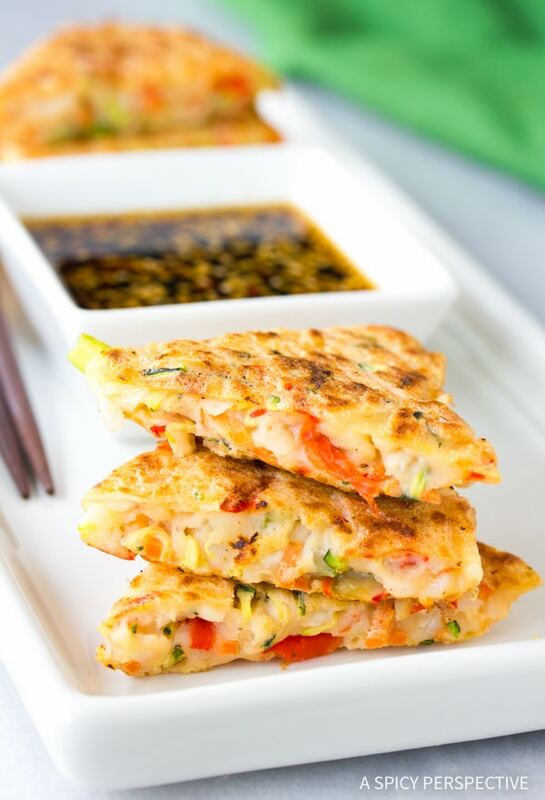 Korean Pancakes are crispy on the outside, soft and moist in the middle, and chock-full of fresh lightly-cooked vegetables. Now, I know we don’t always think of vegetables as kid-friendly, but my two babies beg for Korean Pancakes: Pajun (Pajeon). We also took a little friend, who is extremely picky has a delicate palate, to eat Korean Pancakes with us and she was crazy over them as well. So for the last few months my children + one, have been begging me to figure out how to make Pajun at home. Today’s recipe is dedicated to Carson, Ava and Paiton, my favorite little Pajun eaters. Korean Pancakes: Pajun (Pajeon) is actually very simple to make. Whisk the soy dipping sauce. Beat the pancake batter. Then let the batter rest while you chop up the veggies. 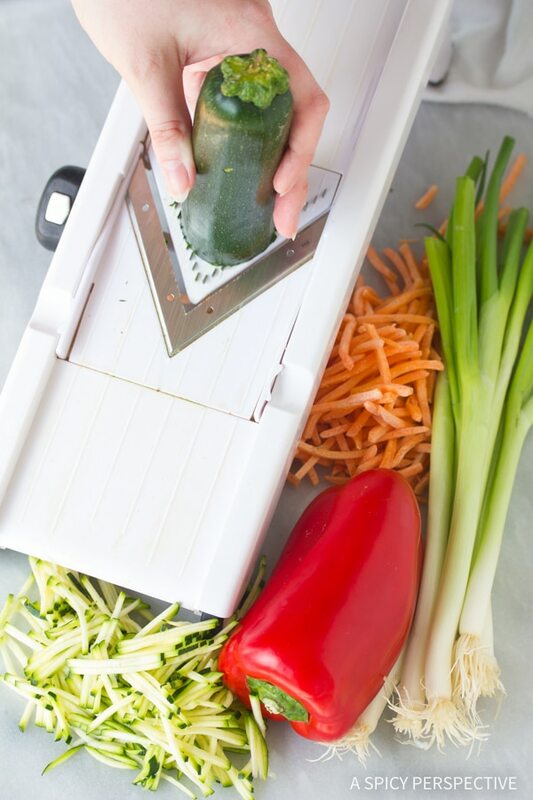 The vegetables should be cut really small, julienne-small, to make sure they cook through. I used my mandoline slicer here to save time. Then mix in the veggies and fry up the Korean Pancakes, 4-5 minutes per side. This is a great make-ahead that can be warmed up in the oven. Korean Pancakes: Pajun (Pajeon) are also really good as leftovers! 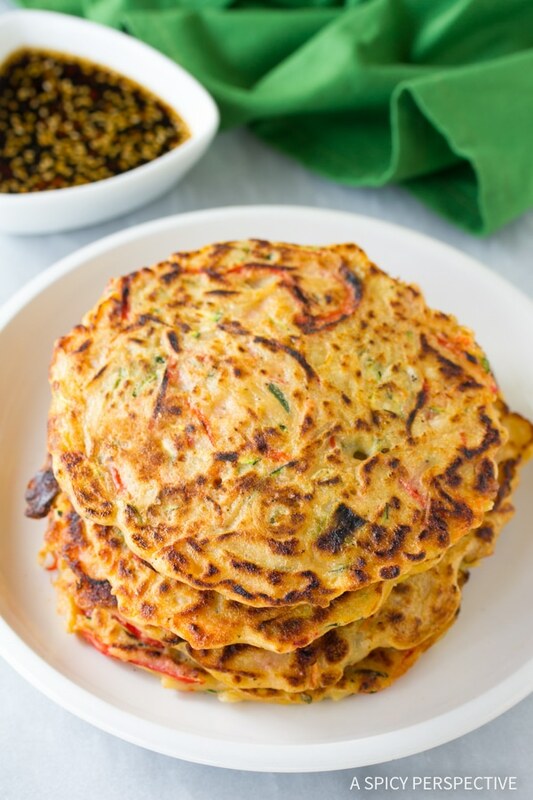 Korean Pancakes: Pajun (Pajeon) - Crispy Korean Pancake Recipe, called Pajun (Pajeon) loaded with veggies and serves with a spicy soy dipping sauce. Place all the dipping sauce ingredients in a microwave-safe bowl. 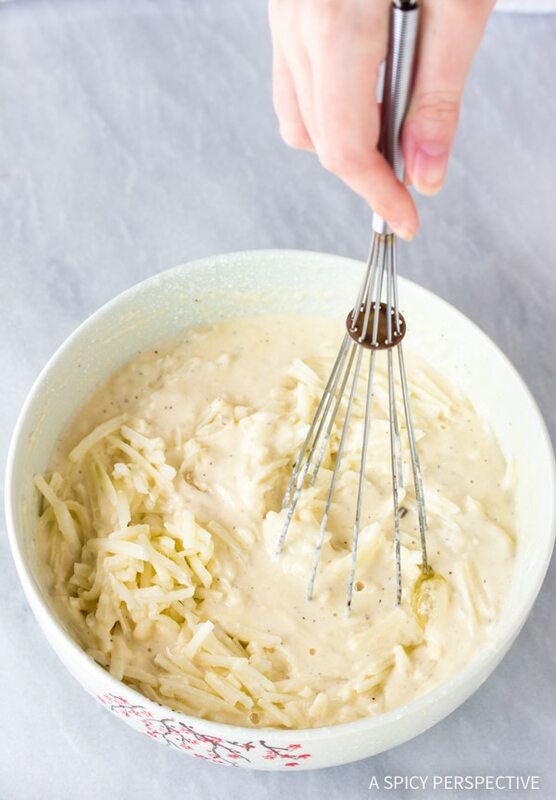 Whisk and warm in the microwave for 1-2 minutes, just long enough for the sugar to dissolve. Whisk again and set aside. In a large bowl, beat together the flour, water, egg and salt. Mix in the thawed hash browns, then set the batter aside to rest. Preheat two non-stick skillets to medium high heat. Slice all the veggies julienne (long thin strips) and mix into the batter. Pepper to taste. If the batter still seems very thick after the veggies are mixed in, add 2-3 tablespoons of water and mix well. Now add a little oil to each skillet and swirl around. Ladle enough veggie batter into each skillet to completely cover the bottom. Fry for 4-5 minutes, per side. Repeat with remaining batter. 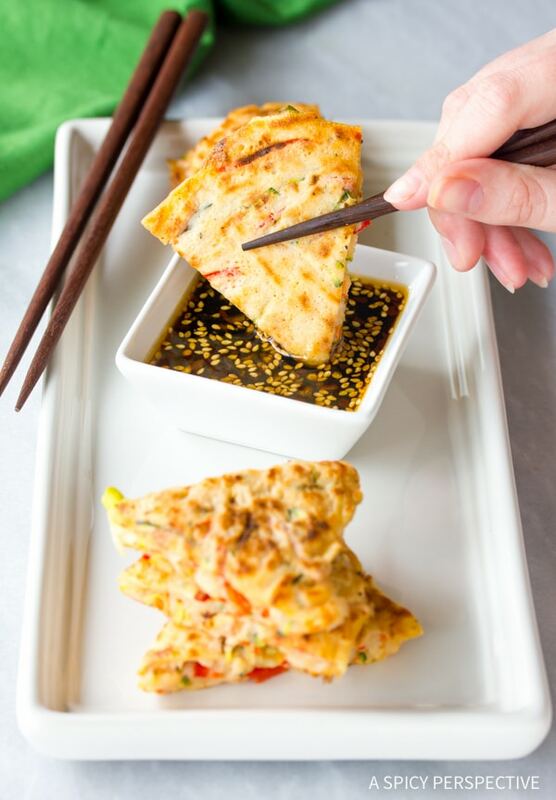 Cut the Korean pancakes into wedges and serve warm with the dipping sauce. Using a 12-inch skillets, you should have enough batter to make 4 large pancakes. Oh my made the Korean pancake and it was amazing. I was a little skeptical mixing the raw veggies with the flour but everything got cooked. Really easy and yummy. Pingback: Korean Pancakes | 2018: Our Year of Cuisines! Looks absolutely delicious. I am vegan so I will do a vegan version (without the egg). Can’t wait to try this. Hi, Did your children enjoy your Pajun pancakes?? Can they be made without the flour and then maybe eliminate the water. I cant eat wheat flour. Can you use gluten free flour? She mentioned in a reply to a comment that she had used different flours, even coconut flour. The little pancakes they give us at the Korean restaurant are what I look forward to. I made these last night, and they were even better than the ones I get at the restaurant! I got around 7 huge pancakes but could have gotten even more if I made them smaller. Like another commenter suggested, I used Chinese cabbage because I couldn’t find zucchini at the store. I probably added a little bit more carrot and potato and only half of the red pepper. It was delicious… And the sauce, oh yum!! 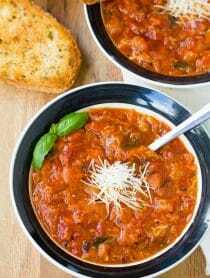 This recipe is so adaptable to what you have on hand too, which is great. The Korean restaurant I go to serves a giant one of these pancakes with seafood in it (mainly shrimp) as an entree. I think I may try to add some shrimp next time! Thanks for this awesome recipe. These are amazing! LOTS AND LOTS of prep work (even with my KitechenAid) but so totally worth it! Thanks for sharing! I made these on Monday as part of our meal prep for the week. They are DELICIOUS! They were even more delicious the 2nd day after I toasted them in the toaster oven. I used whole wheat flour and followed the directions just as stated. The only thing was that I needed way more liquid to be able to “ladel” the batter into my pans but I just eyeballed it so it was no big deal. I think the batter just needed more liquid since I was using ALL whole wheat flour. These made our list of meatless meals! YAY! Thanks for sharing. Looks fantastic! Looks very similar to adai, a South Indian pancake which is made with lentils. Gonna try this soon! Hi! I am looking to make a dinner out of these, any recommendations for sides? I am vegetarian but my family still eats meat :) any suggestions are appreciated. Thanks! I make these with my panini maker – I know, weird (but not hotdogs in a coffee pot weird). I also add a little soy sauce to the batter, and I make them with shredded cabbage or brussels sprouts instead of zucchini. They’re also yummy with strips of julienned uncured turkey bacon on the outside. I put that down first, with gaps between the strips, layer on the batter, top it with another sprinkle of bacon and close the lid. In the time it takes to whip up a batch of rice in the rice cooker, everything is done. These are amazing. I actually have my own recipe as well. Have you ever tried it with sweet potatoes? It’s amazing! Thank you for posting this as I was trying to make sure I was making them correctly – the way my mother made them for me as a child. Great recipe. For a little extra kick, I chopped up 1/2 cup of kimchi and added it to the batter. Thanks for sharing. These look delicious! I am actually going to try it as a breakfast dish, although maybe without the dipping sauce. I think my kids will love it as well! I love these Korean pancakes! Sorry if I missed where to find it but do you have any nutritional information for your recipes? I tried making this but, while i was cooking it, I found out that it took way too long to cook. After I flipped it over I noticed the pancake wasn’t cooking that well on the underside and the vegetables were burning when I left it on the stove for a longer time. What do you think I did wrong? Is it because I didn’t cut the vegetables small enough? Hi Jamie, it’s hard for me to tell without seeing them, but I wonder if you needed to adjust your burner. Sorry you had a rough time! I’m from the Philippines and we have this same kind of dish we call as “UKOY or OKOY” and I really like my moms cooking of this as i’ve grown to love this I also did some variations with the recipe instead of water I use beer or milk and for veggies I substitute mine with dried tiny shrimp or fish flakes I still yummy! These looks great. Can they be made a day ahead of time? I want to serve them at a big cocktail party and have so much to do, I dont know how I can make them that day. Could i make them and then reheat in the oven? oh heavens, this sounds so good – think I will serve these w/the stir-fry I plan on making this week. We lived in Seoul for 2 years…looking forward to making this this next week! LOVE these things, can’t wait to make my own at home! I love this recipe! How delicious! The entire family liked these pancakes. The dipping sauce was wonderful and the kids did not even seem to notice all the veggies packed inside! We are making them again tonight as requested by a 6 year old. Would it be ok if I included this recipe in a book I am writing? Eli, Please email me via the contact form. Thanks! These pancakes look amazing, I love reading about (and eating) different world cuisines – and I love your step-by-step photographs. Pingback: Blog shoutout. A shoutout to all those awesome Bloggers! These look so good, Sommer! I love the dipping sauce. It is one of the very few times i have made a recipe where the final product looks similar to the photos posted..:) This recipe was easy to follow, fun to make and most of all very, very tasty! The sauce was to die for. Can’t wait for lunch today (leftovers). Thank you for your lovely posts – i look forward to reading your blog throughout the week. Nice to see a comment from someone who has actually made the recipe. So many commentse like “looks great” aren’t very helpful! Yum! I love Korean food but have never made it myself. These are going to be made soon! I haven’t had that much experience with Korean food but this pancake looks so tempting I could become a fan real quick!! Love this! I actually grew up on these. My mom loved making it with green onions. I definitely have to give this a try. I don’t think I’ve ever made it myself! I have been wanting to make these forever–now when I do, I’ll use your recipe! They look awesome. YUM! I can’t wait to try these, they look delicious! I am always looking for new recipes to spice up my dinner routine. These pancakes look healthy and so easy! 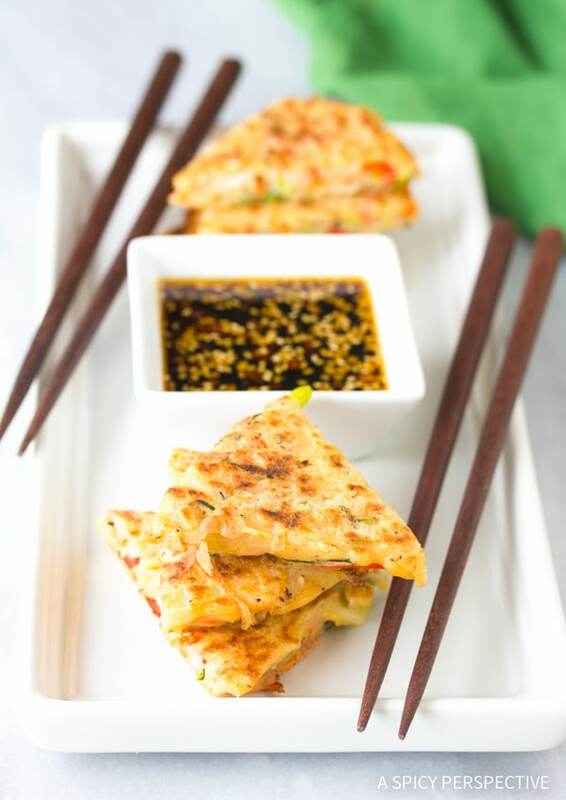 Just saw a video on how to make scallion pancakes… and if I wasn’t craving them then, I certainly am now! These look great! Sommer, these look so delicious! I just got my bf and his brother to eat latkes for the first time the other day and they both liked them a lot. 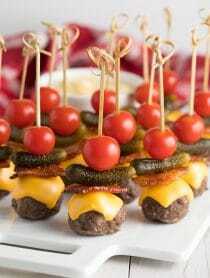 I think these will be a perfect and yummy way to get them to eat more veggies lol. Plus I love any excuse to use my Mandoline! These look wonderful and I am sure I could find a way to make them gluten-free. Love the dipping sauce too! Sounds yummy. I’ve been making a very similar pancake for years every summer with the tons of zucchini I get from my garden. They are just to delish! Thanks for sharing. I need these in my life. I am totally in love with that OXO beater. I use mine all of the time. I don’t think I’ve ever had a Korean dish, but these sound amazing! This looks awesome! I am bookmarking these pancakes to make this weekend. I can;t wait! Korean food certainly does not seem to get the same attention as other Asian cuisine. This is a beautiful introduction and representation to bring people into the fold! By the way, I just made a Blood Orange Margarita using the Villeroy & Boch glasses I won from your blog a while ago. Those glasses are so gorgeous! So, THANK YOU again. :) Cheers to you and wish you a wonderful weekend. Amy, I always get excited to pull out my V&B glasses too! Happy Weekend! This dish looks great and I always am looking for another way to use my mandoline. The dipping sauce might be my favorite part. how do you do it…you never seem to run out of fabulous recipes. thanks for this one in particular! Thanks for sharing the recipe, i absolutely love this dish! these sound SO stinking good!!! That dipping sauce has my name written all over it! I have never had anything like that. What a gorgeous, flavorful creation! I NEED A MANDELIN SO BAD. i know i mispelled that, but I need one!! Ok, I’m absolutely obsessed with this. We get this almost everytime we go out to eat Korean. It’s always our starter. I LOVE that you made this at home! love love!! My toddler seems to be developing a “delicate palate” – hoping it’s just a phase! Can’t wait to see how she likes these. I *know* I will! These look so tasty, Sommer! Golden perfection! These are gorgeous, Sommer. And I NEED that mandoline!! Hey Brenda, I just got it from OXO and it is AWESOME. I’ve had a couple others before and this one blows them away. this is soooo my jam. I need these tomorrow. why aren’t we neighbors!?!?!? Sommer, these Korean pancakes look amazing ~ must try asap! We love Pajun – sometimes we add seafood to them – they are so good! I have a few friends with “delicate palates” they would love this!! This looks amazing! I have never tried Korean food but this could make me a fan! Korean pancakes look like my kind of pancake! We’re reaaaaaal big egg eaters up in here and these pancakes looks so healthful and tasty! I love ethnic food and have never tried Korean! Excited about my new find! Have a fun weekend, Sommer! This looks so great, I’ve never had anything like it. Your global cuisine posts are always inspiring! 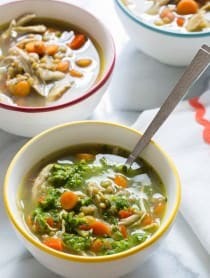 I’m so excited that I came across this recipe! There was a little place I used to go for lunch and the owner served these with the bulgogi. They were easily my favourite part of the dish. I can’t wait to try making these! Thanks for sharing! These look so incredible. and with that sauce? I can’t wait to cook these up this weekend? I will be in Asheville this spring, so maybe I will have to visit this restaurant? Absolutely! We will have to meet up for lunch! Just wanted to note here that your restaurant link doesn’t work. Ok, what a fabulous dish! I want!! I don’t know if i have ever heard of a Korean pancake but I love the sound of it!! These look perfect, Sommer! We’re always trying to include more vegetables into our diet, so I can’t wait to try your recipe. Plus, any excuse to use my mandoline is a good one. One of my early morning stops in Seoul, walking from hotel to my company’s Seoul office, was a small tent erected in a parking space. The women there made breakfast sandwiches: pajun & a thin slice of spam on toast. It was at the halfway point, a minute in the tiny tent waiting for breakfast to be made was a wonderful warm respite from the Korean winter. And the sandwich & coffee was delicious! Thanks for sharing that Mike. Some of my most memorable meals have come from street vendors while traveling abroad. Well, I know what I will be making for Paiton this weekend! Sommer, this looks amazing! When my husband and I were dating we would always order these at our favorite place – these look incredible!! Definitely one of those favorites. You did these up perfectly!